Meet two of Alaska's best cliff-side climbers, the Dall sheep and mountain goat. Back to animal directory. 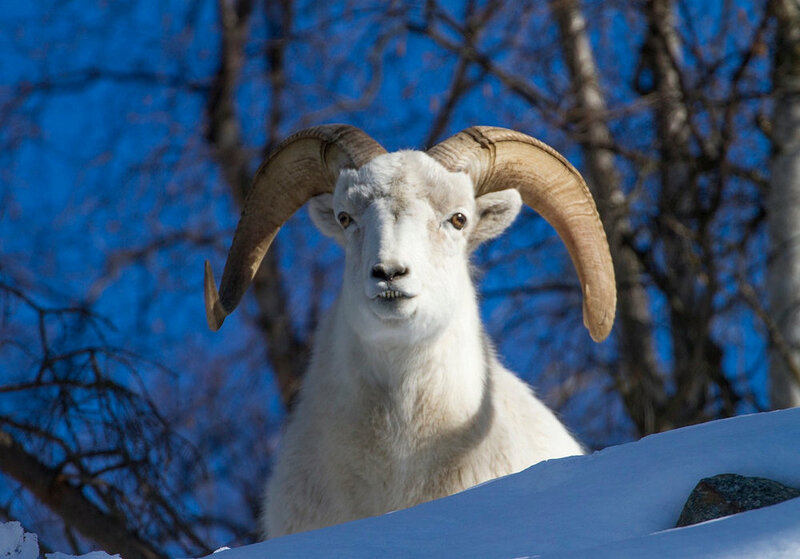 RANGE: This sheep species is found at high elevations in mountain ranges throughout Alaska. Their ancestral habitat is the Tanana-Yukon uplands, which now has fewer than 1,000 sheep. SIZE: Rams (males) weigh up to 300 pounds; ewes (females) are closer to 150 pounds. PHYSICAL FEATURES: Both rams and ewes have horns. The horns of the rams in particular are the largest of all ruminants in relation to their body size. Yearling rams have smaller, straight horns that look similar to adult ewes. Only mature rams have massive curling horns—used as a symbol of rank. Their horns grow throughout their lives, with growth stopping each winter. This creates rings (annuli) which can be used to indicate age. FOOD: Herbivores. Dall sheep eat grasses and sedges. Their winter diet is limited to frozen grass and sedge stems. Some eat significant amounts of lichen and moss during winter. Their digestive system is adapted to utilize low quality food during winter and during food shortages. BEHAVIOR: Unlike mountain goats, which are methodical climbers, Dall sheep jump through rugged cliffs to escape danger and are capable of running very fast for short distances. CONSERVATION: The remoteness of their habitat is a good buffer from humans, but the use of alpine areas might cause problems in future. Population growth is slower due to low birth rates (sometimes every other year), high predation and difficult terrain. These are continuous pressures they face. PLANT NOTES: Dall sheep eat a variety of plants and berries during summer months. Species include horsetail ferns, willow, fireweed, cranberries and grasses. Their winter diets consists of lichens, mosses and frozen grass. Food availability is a limiting factor, especially when deep snow or thick ice cover their range. Many sheep starve during winters where plants are inaccessible. NOTE ABOUT DALL SHEEP: Many people do not realize the role Dall sheep played in the establishment of Denali National Park, long before Alaska was even a state. To learn more about this history of a species inspiring change, click here. LIFE SPAN: 12-20 years in captivity. RANGE: Mountain goats are found in the steep and broken mountain ranges of northwestern North America, from the northern Cascade and Rocky mountains to Southcentral Alaska. SIZE: Males (billies) weigh 260-350 lbs, females (nannies) weigh up to 180 lbs. PHYSICAL FEATURES: The mountain goat is the single North American representative of a unique group of mountain ungulates called the Rupicaprinae, or “rock goats.” They are characterized by having relatively short horns (both sexes have horns; females smaller than males) and a fondness for living in rugged terrain with sheer cliff walls. Mountain goats are one of two species of all-white, hoofed, large mammals found in Alaska and are easily identified from Dall sheep by their black horns and where they are found in the state. These goats are adapted for extreme winter conditions and have a long, shaggy winter coat. FOOD: Mountain goats are both grazing and browsing animals, depending on the particular habitat and season of the year. They normally summer in high alpine meadows where they graze on grasses, herbs and low-growing shrubs. As winter advances, feeding habits generally shift to browsing. Blueberry, hemlock and lichen can be important winter diet items, but feeding habits in winter center on availability. BEHAVIOR: Goats in coastal areas have altitudinal migrations from alpine summer ranges to winter ranges at or below tree line, typically in old-growth forests. In interior areas, mountain goats winter on windswept ridges as long as they remain uncovered by snow. Breeding season for mountain goats occurs between late October and early December. Mountain goats have a polygynous mating system, meaning that males will breed with multiple females but not vice versa. A single kid is born in mid-late May after a gestation of 180 days. Kids stay with their mothers until the next breeding season and often for some years beyond. Predators include bear, wolves and lynx. CONSERVATION: Mountain goats occupy remote habitat and are therefore the least studied large mammal in North America. Mountain goat populations are stable in most of their range.